Are you looking for an extraordinary centerpiece for your Outdoor Room that will not only spark a conversation, but spark a fire where your guests can warm up? 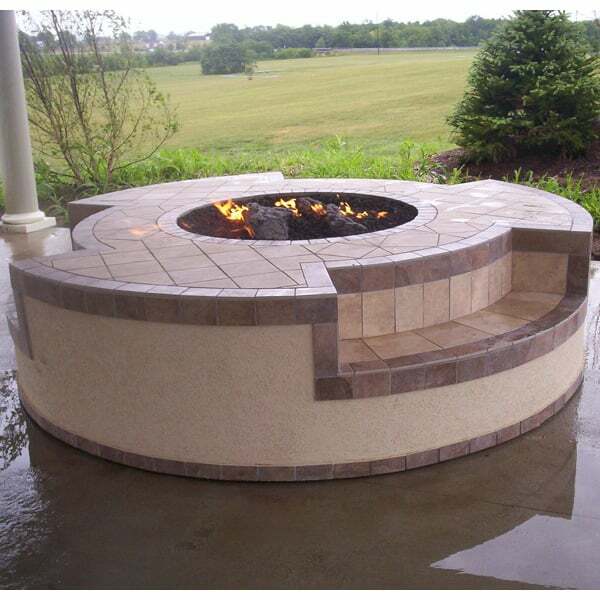 The "Edwards" Outdoor Fire Pit Project showcases an impressive, circular design with built-in benches surrounding an easy-to-start propane Fire Pit! Do you like the design but feel the materials fail to match your home? No worries! The "Edwards" Outdoor Fire Pit by Leisure Select offers custom stucco and tile - we promise you can find the perfect materials to match your homes colors and style! Nothing warms up visitors during a fall or winter party like a fire pit! So spark some warm conversations in your friends and neighbors alike with the "Edwards" Outdoor Fire Pit Project by Leisure Select!